The second annual Disneyland Paris Magic Run Weekend was held September 21st through the 24th. In addition to the Half Marathon, this year’s event moved the 5K to Friday evening and added a 10K race and 10K+Half Marathon, 31-kilometer Bibbidi Bobbidi Boo Challenge. 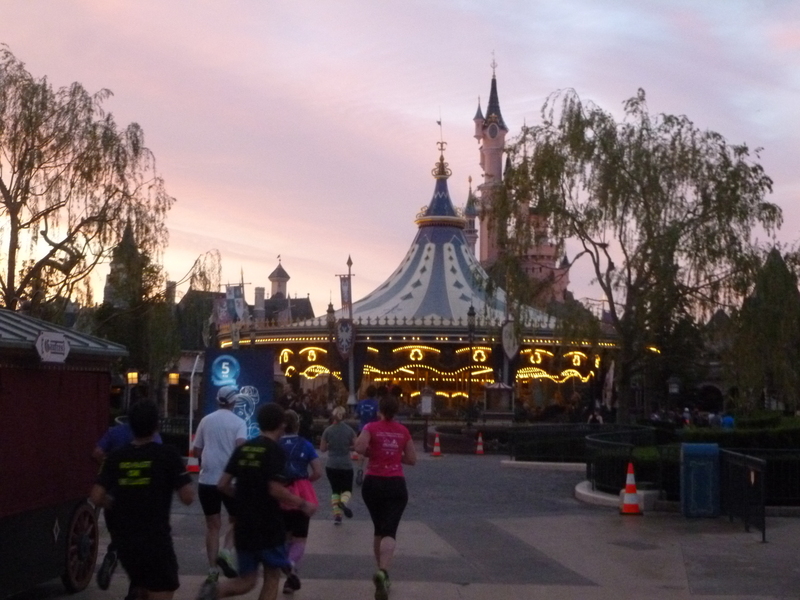 Runners could also earn the Castle to Chateau medal for completing the Disneyland Paris Half Marathon and a U.S. runDisney half marathon or marathon in the same calendar year. Although I didn’t really plan on attending this year’s event, I enjoyed last year’s races enough that I looked into it on a whim around the time registration was opening up, and discovered that I could do it for a relatively affordable price. 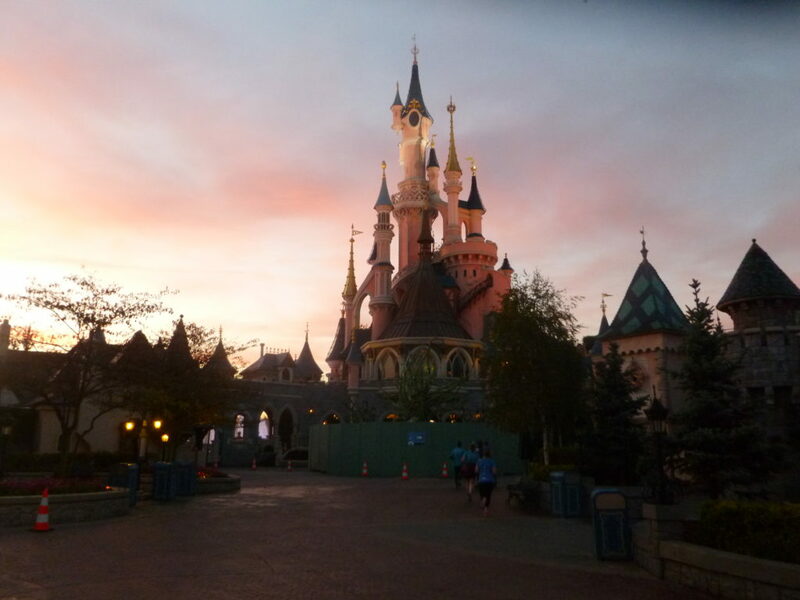 I fly to the west coast for race weekends a couple times a year and determined that I could actually do a quick trip to Paris for about the same price, thanks in large part to lower race registration costs and affordable hotel pricing in Val d’Europe, Disney’s planned community that’s a quick train ride from the parks. To minimize vacation time, it was a short trip for me, but surprisingly affordable and rewarding, with some time to visit the world-famous cultural sites in and around Paris as well as the Disney parks. With that information in mind, I decided to register, and the process was more frustrating than exciting. Having experienced my share of disastrous registrations for U.S. races (including the 2012 Marine Corps and Chicago Marathons, which were so bad that the registration platform most U.S. races use underwent a massive overhaul), this was by far the worst. After being abruptly canceled the first day due to technical issues, it reopened the following day with no apparent resolution to the problems. 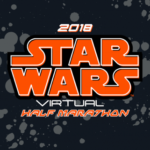 Over the course of two days, it took me about four hours to complete the seemingly-simple process of signing up; for reference, I managed to complete all 22.3 miles of the three races in less time than it took to register. 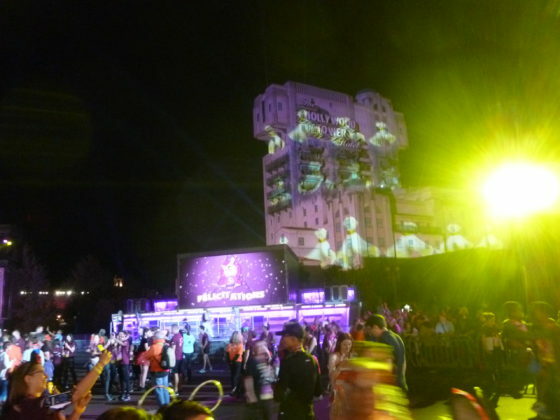 On the other hand, once registration was complete, the registration platform was used as an ingenious way to purchase PhotoPass, park tickets, and other add-ons that were automatically linked to your runner account; once everything was up and running it was great, but the initial chaos was terrible. Despite a relatively late registration, not opening until about three months before the race, limited information was available about the weekend’s events. 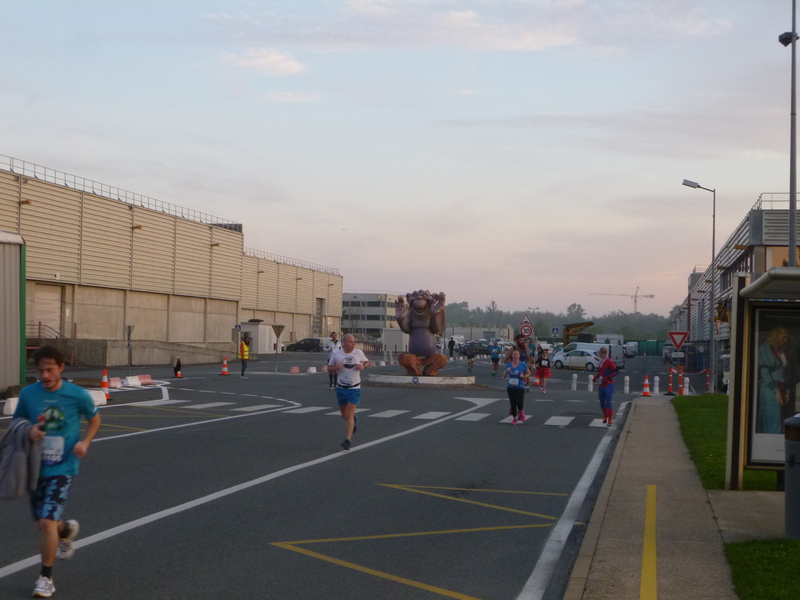 Communication from the race organizers was non-existent, including during the registration shutdown. 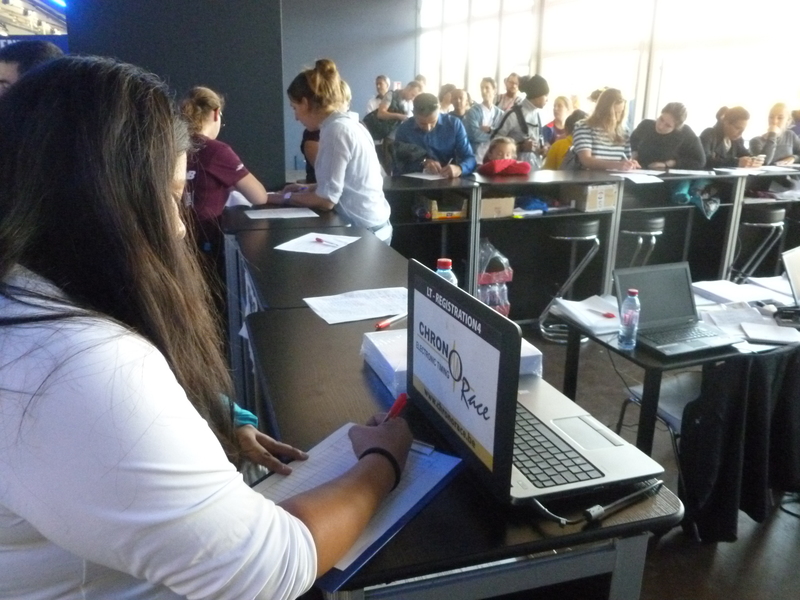 Information like expo logistics, course maps, and staging areas weren’t released until the week of the races, and even then were only available digitally. Considering many runners traveled long distances, this information was shared too late for many to see it before beginning their journeys. Additionally, it wasn’t until this time that it was revealed that the 10K would be an untimed fun run, purportedly to avoid French regulations requiring medical waivers for races. Although there’s nothing inherently wrong with making an untimed event, it was disappointing to learn this information so late in the process, since it felt like a bait-and-switch; I’m glad I wasn’t planning to use the race to attempt a personal record. After arriving in Paris early Friday morning, and spending the day exploring the city and meeting up with my travel companion at the hotel in the afternoon, we headed to the Health & Wellness Expo to collect our race packets and prepare for that evening’s 5K. 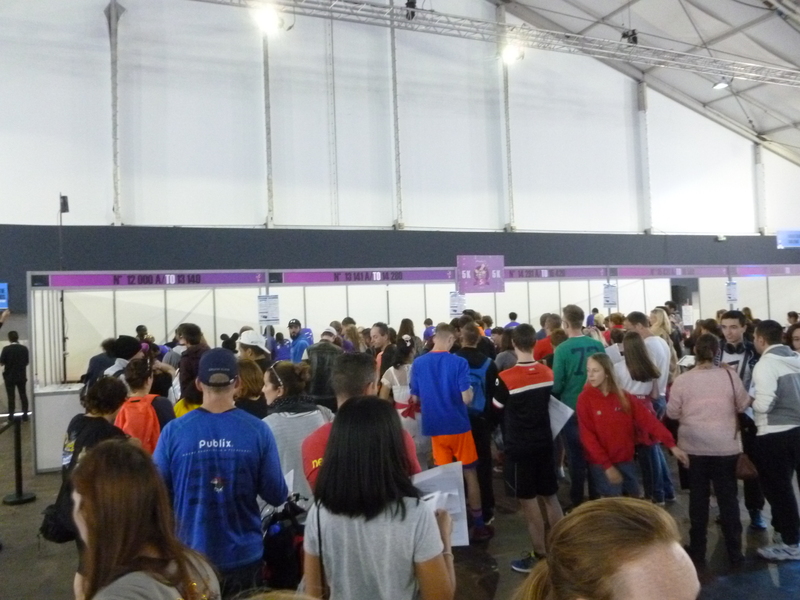 We got to the expo about an hour and a half before the deadline to pick up packets for the 5K and were somewhat surprised by how busy it was, compared to the easy experience we had at last year’s expo. Even more surprising was how slowly the pickup line was moving. Presumably, the volunteers had familiarized themselves with the process and few bibs remained to search through, so it should have been a very quick process. 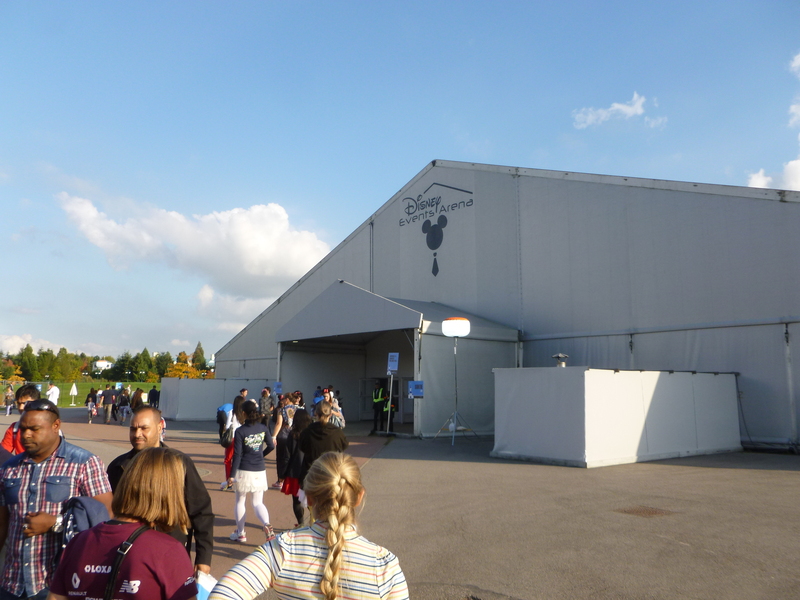 Instead, it took about half an hour to get to the front of the 15-person queue. 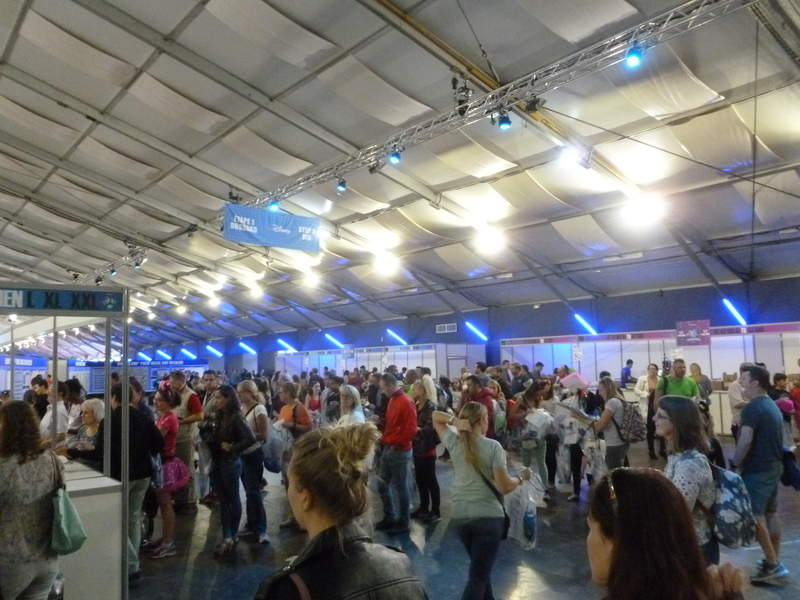 Packet pickup for my challenge bib was much smoother. After getting my bibs, I went to pick up my race shirts, only to learn that they had run out of challenge shirts in my size and 5K shirts in every size except for women’s medium. 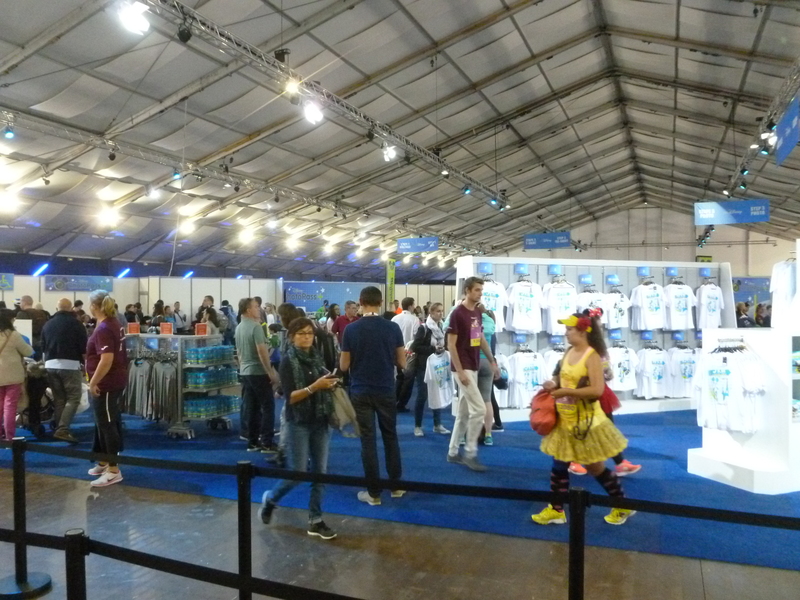 We were directed to the Runner Relations booth, where they had several sign-in sheets for people missing shirts to write down their shirt and address; the sign-in for missing shirts honestly seemed better managed than the official pick-up areas. As of two weeks after the event, I have heard nothing about actually getting those shirts, and frankly, I would be surprised if it happened at this point. The rest of the expo was somewhat of a blur since we were in a hurry, but it seemed to be handling the crowds better than the official pickup areas. The 5K course started in front of the Sequoia Lodge Hotel, crossed through Disney Village, and twisted and turned all through Walt Disney Studios Parc, making use of guest areas, the Studio Tram Tour route, and backstage roadways. In a new twist that echoed the early years of Disney’s U.S. races all of the weekend’s races finished in the park, in the plaza between the CineMagique building and Tower of Terror. With a quick break for dinner in Disney Village, we met up with another LPer and headed to the start corrals for the 5K. 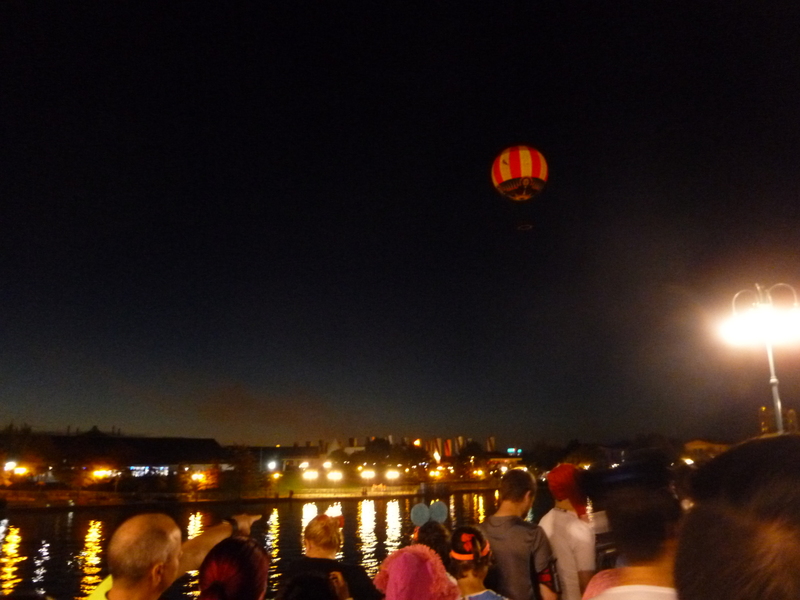 Lined up around Lac Disney with entertainers on floating platforms, the start area had a very festive atmosphere. 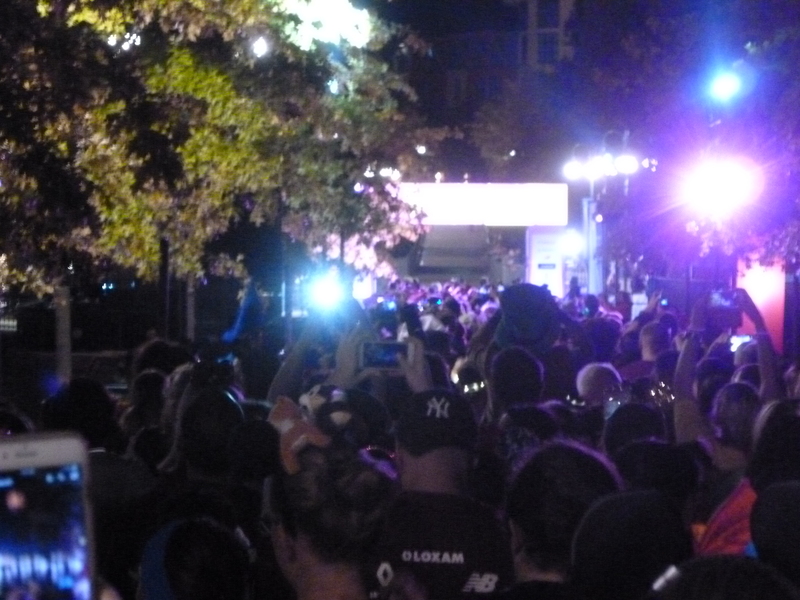 After an unannounced delay, followed by countless wave starts to disperse runners on the course, we began our race about 45 minutes after the race began. 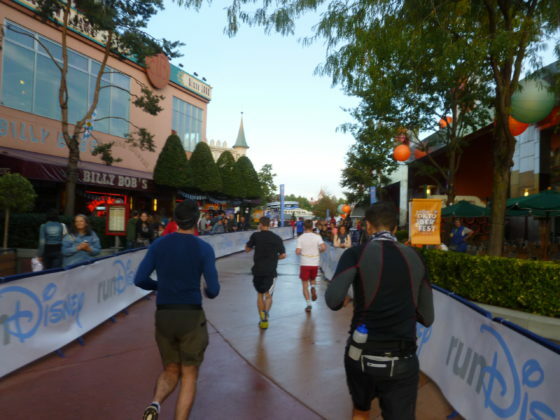 The evening course through Disney Village was a lot of fun, bringing festive crowds to cheer runners on, including those who were partaking in the official Oktoberfest festivities. 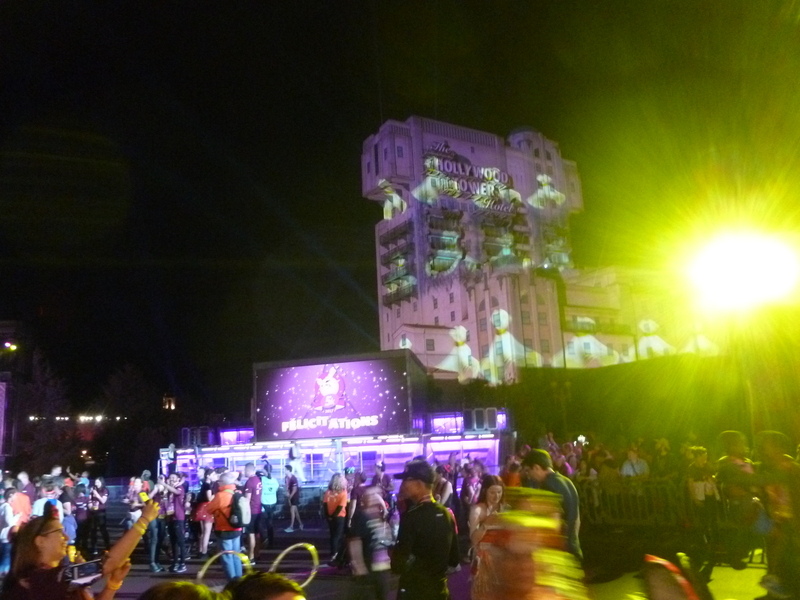 Moving into the park, the festive atmosphere continued with enthusiastic Cast Members and party lights everywhere. 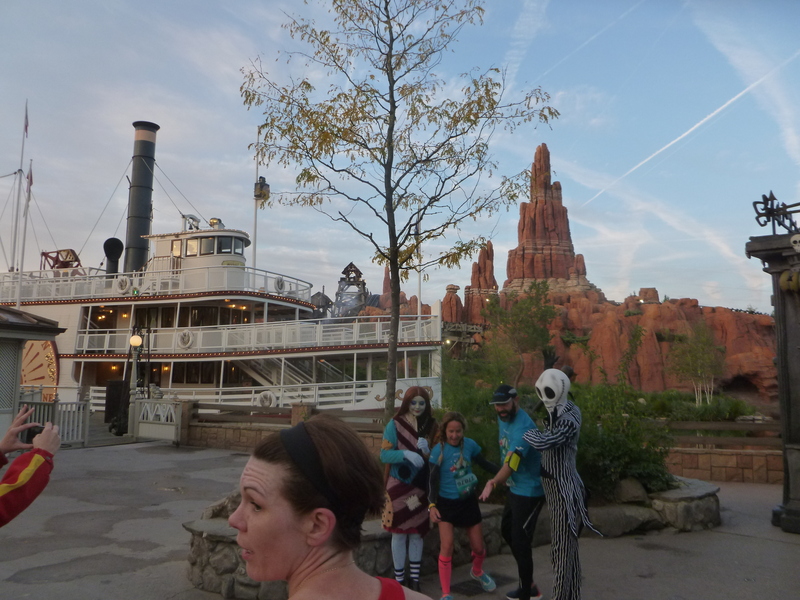 It was especially fun to get up close with the props and sets along the tram route, with many runners taking advantage of the opportunity to take unique photos. While the tram route made for a great way to get more distance inside the park itself, some parts of the tram route and backstage were very dark, making it difficult to see the road; we weren’t pushing the pace, but I doubt the conditions were safe for faster runners on a crowded course. 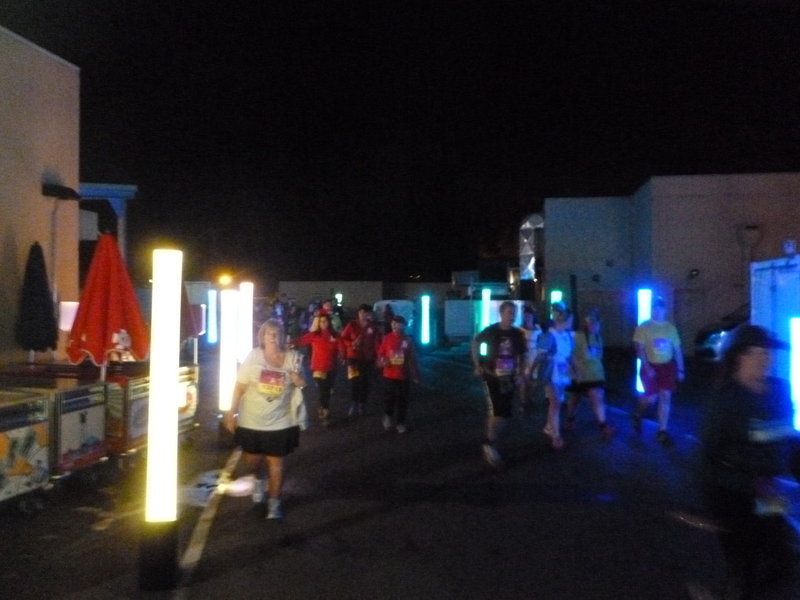 We finished the 5K in a comfortable 55:45, making sure to run the last few steps to make it count. 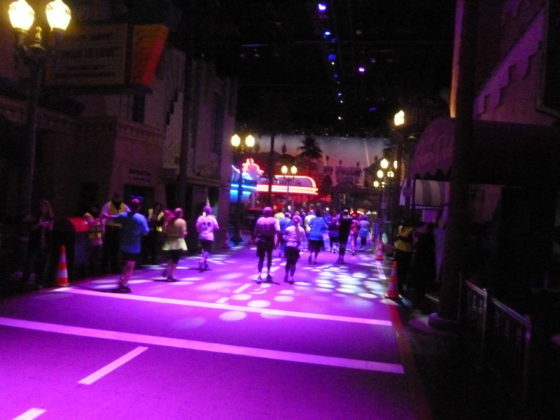 Beginning near World of Disney, the next morning’s 10K course entered Walt Disney Studios Parc, passing through Toon Studios and along the tram route before crossing back into Fantasia Gardens and into Disneyland Parc. 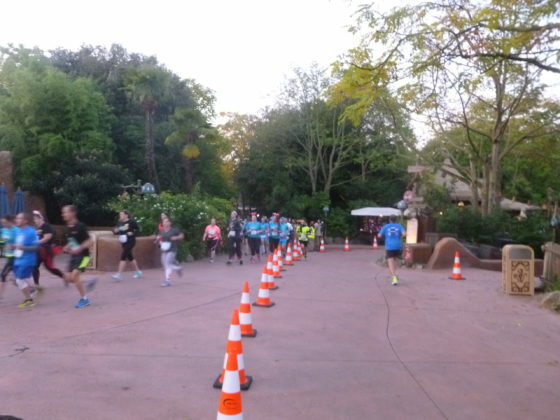 Heading up Main Street, runners looped through Frontierland, Adventureland, and Fantasyland, passing through the castle en route to Discoveryland, and then heading backstage before returning to Fantasyland and Adventure Isle. After a loop around the west backstage area, the course circled Frontierland, headed back to the tram tour route, and finished in the Production Courtyard. 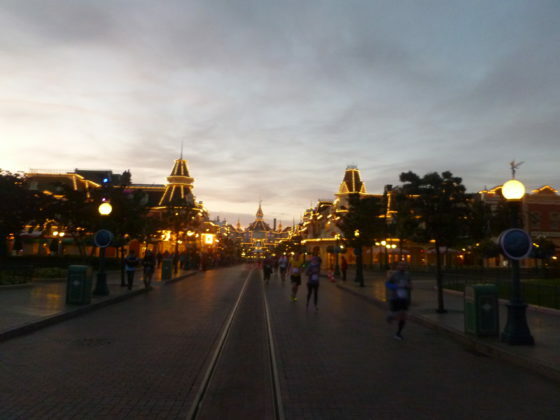 Well before dawn the next morning, we headed to the 10K start. 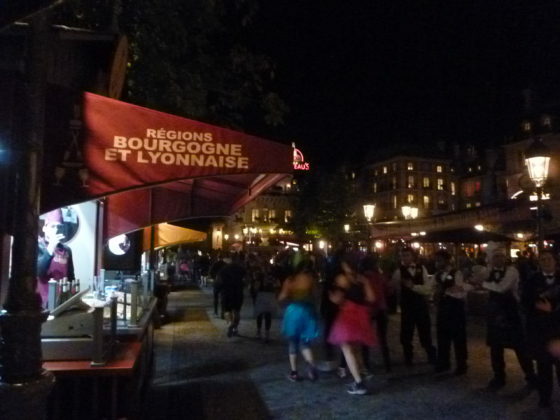 In order to avoid the hassle and crowds of the RER train, we walked from our hotel in Val d’Europe, which took about 25 minutes. 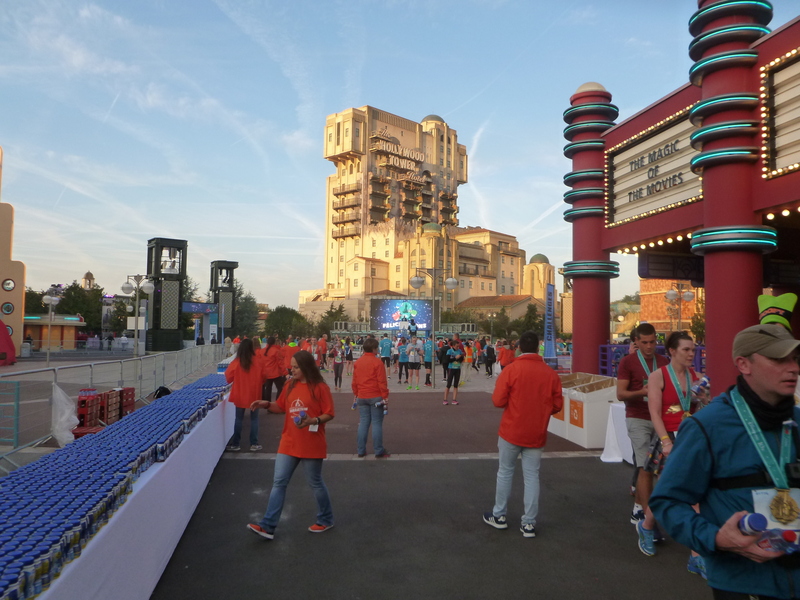 With a new pre-race configuration to allow more runners to see the main stage (and additional jumbotrons for those who can’t), the hosts did a great job of keeping runners entertained in a multi-lingual manner during the long wait for the race to start. 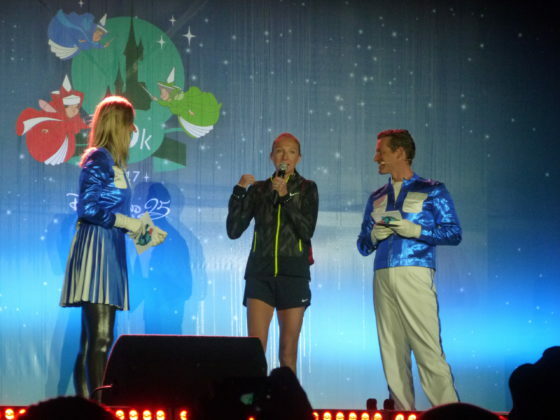 Race ambassador and marathon world record holder Paula Radcliffe made an appearance to give some racing tips, and others led the group in pre-race calisthenics. In an odd tradition that I remember from last year, instead of slowly guiding runners from the holding corrals to the start area, the barricades were removed and there’s a quick stampede as everybody ran at full speed to the next holding area. 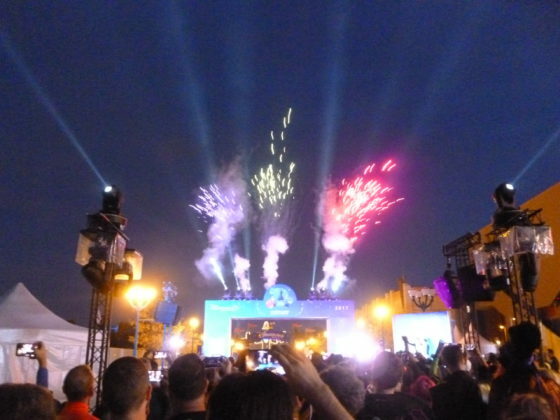 Despite the seemingly infinite number of wave starts, fireworks sent each group off in style. The course was very crowded in the first few moments, but the field quickly dissipated as I entered the park. Although I hadn’t planned on stopping for many character photos, the low crowd levels and huge numbers of characters made it easy to get some quick snapshots. Along with some of the standard characters who are found in the parks daily, I was excited to see some more unusual ones, like Stitch’s girlfriend Angel, the Cheshire Cat, Yzma, Kronk, and Cuzco. 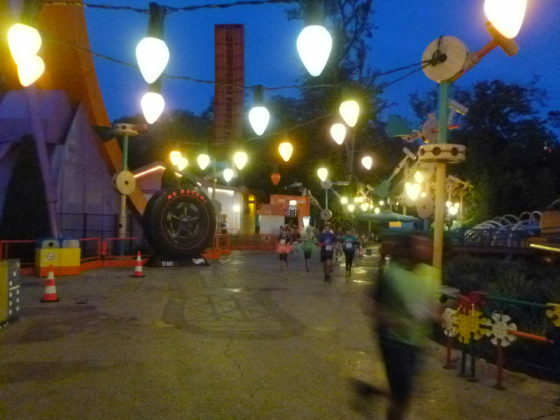 Although industrial, even the backstage areas were pleasant to run through, with understated landscaping and familiar props from previous in-park promotions. Similar to the other races, the finish line inside the park was a fun theory, but didn’t work as well in reality. The physical space required a fairly narrow finish chute, which led to lots of crisscrossing when runners stopped for character photos. There also wasn’t much space for medal and post-race refreshment distribution, so they were squeezed into an awkward side path. Because the race facilities took up most of the available plaza space, there was very little room for spectators, and no real reunion/recovery area to hang around and rest after the race. 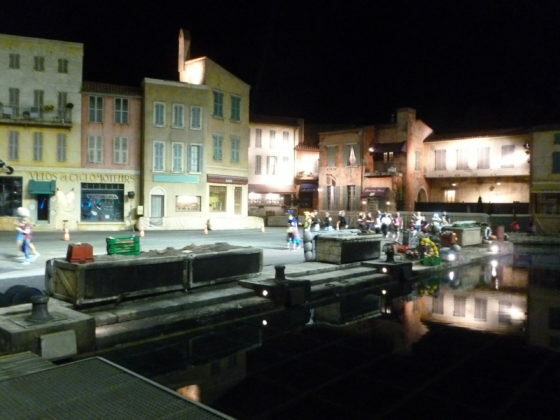 And to top it off, the Production Courtyard is easily the ugliest area of any Disney theme park in the world, so there really wasn’t anything particularly special about finishing there. 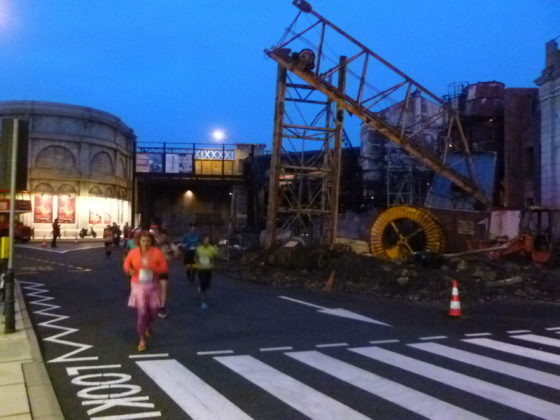 Although I appreciate the creativity to give something new a try, last year’s parking lot finish was a lot more practical. I finished the 10K in 58:29. 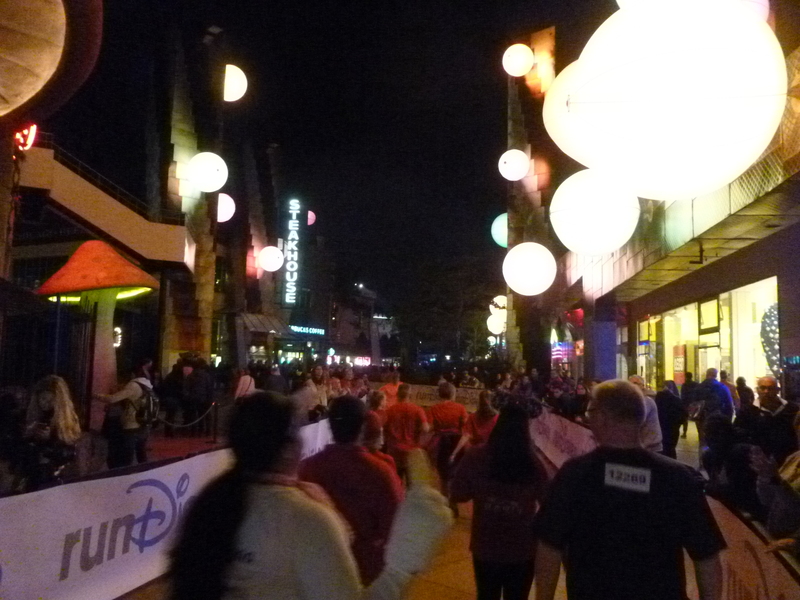 Sunday’s 21.1-kilometer half marathon course began near World of Disney before turning toward Walt Disney Studios Parc. 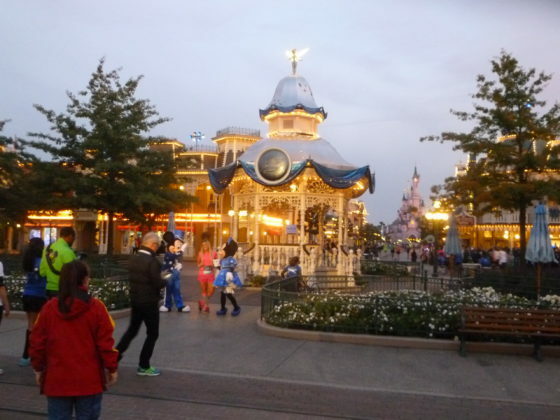 After passing along the park’s backside and along the tram tour, runners entered Disneyland Parc through Frontierland, before heading up Main Street, through Adventureland and Fantasyland, exiting through Discoveryland. 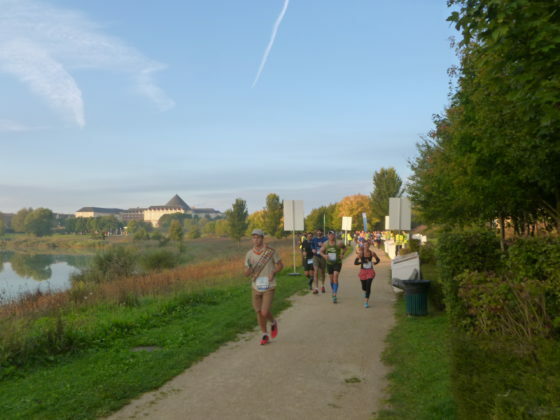 After a brief glimpse backstage, the course turned onto the main ring road around the parks, past some open farmland and into the village of Magny-le-Hongre for a loop around a scenic lake. The course then went back up the hill and out of Magny. 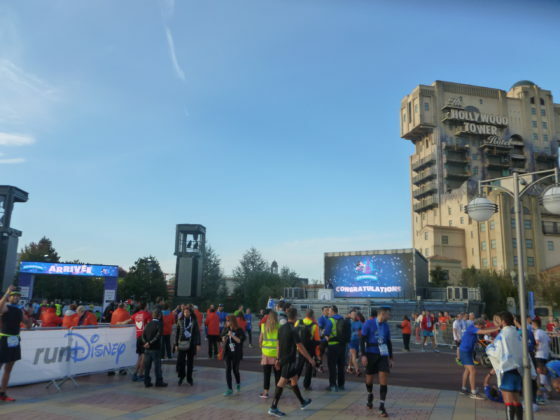 With a short out-and-back along the ring road, the course returned to Disney property, passing through Hotel Santa Fe and Hotel Cheyenne, looping around Lac Disney past the Sequoia Lodge and Newport Bay Club, through Disney Village, and back into Walt Disney Studios Parc for the finish. 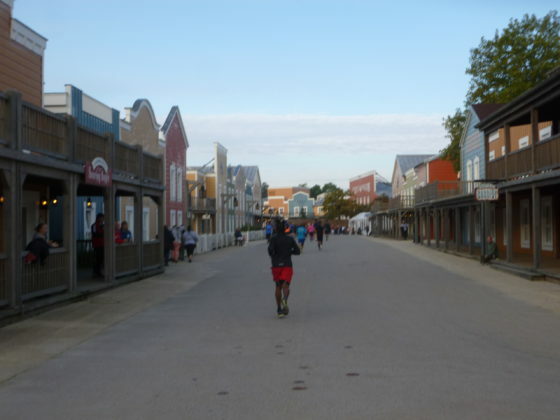 With another chilly early-morning walk to the corrals, we found ourselves at the very front of our corral through a quirk in the arrival process. 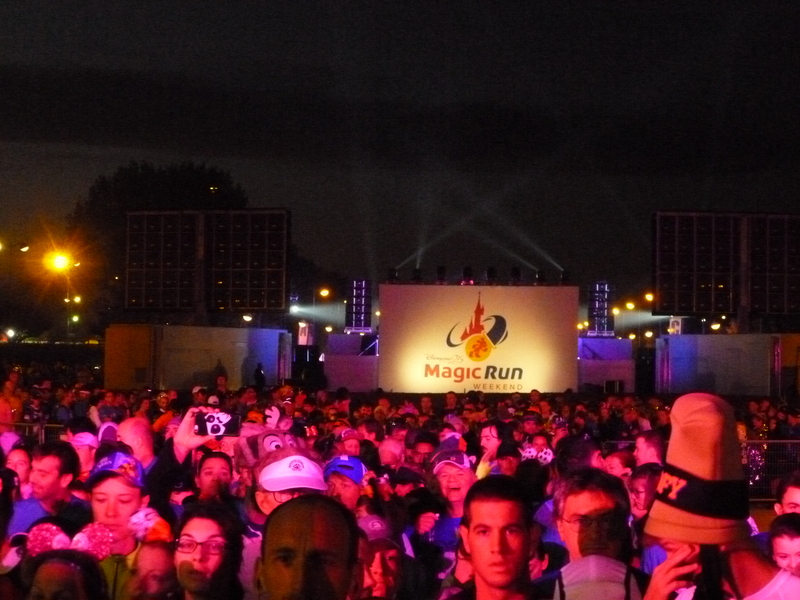 After the requisite pre-race entertainment and announcements, we were off. 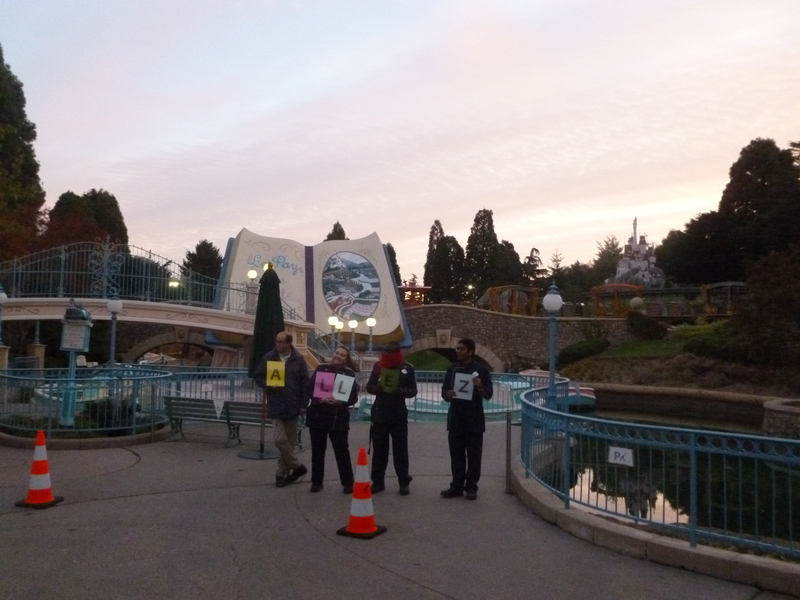 The huge amount of in-park time at the start of the race was a lot of fun, with enthusiastic Cast Members cheering runners on; unlike at U.S. events, where Cast Members often seem like they’re phoning it if, the races in Paris are rare enough that the excitement seemed genuine and infectious. Another benefit of the early miles was getting to see the parks come alive as the sun began to rise. 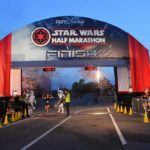 With roughly 2/3 of the total race distance on Disney property, the course is one of the most scenic and interesting I’ve run anywhere. 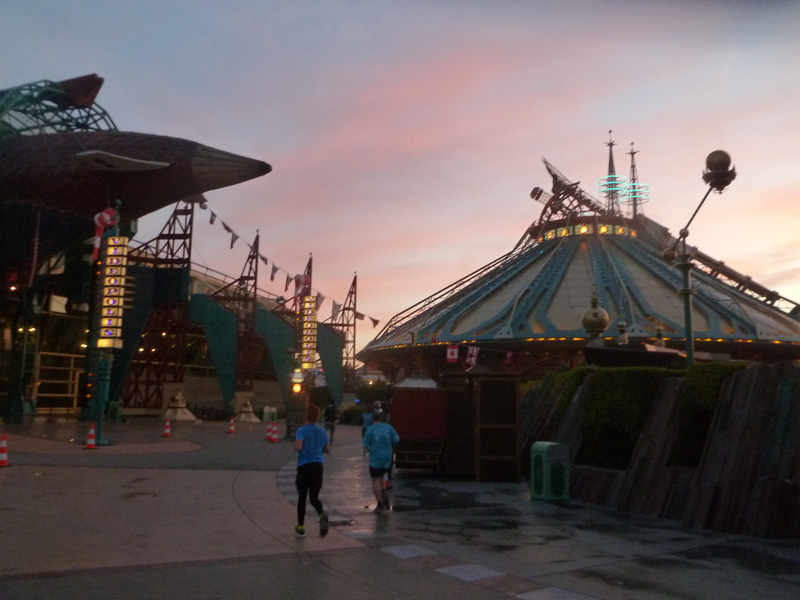 After leaving the parks, it was great to run through the understated beauty of the French countryside. 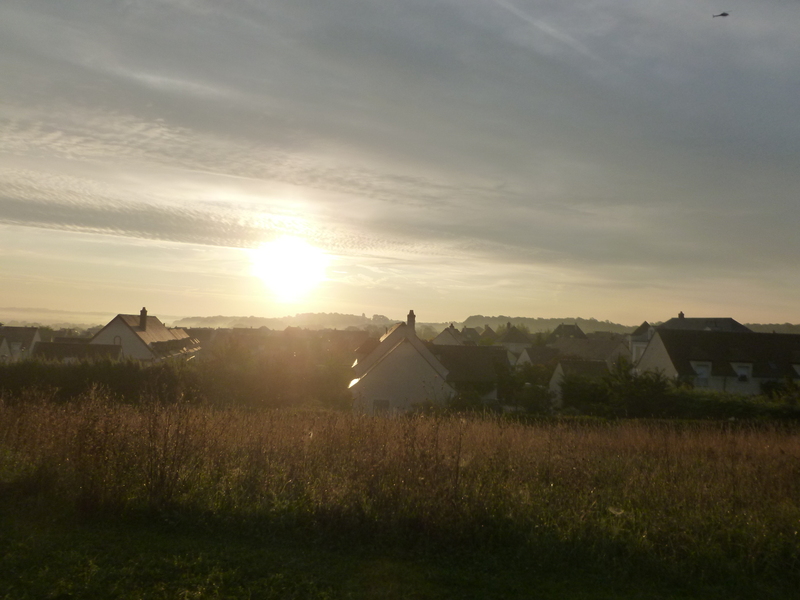 I’m a sucker for a good sunrise, and watching one over the empty fields with the village of Magny beyond was a great way to start the morning. The loop through the village also did a good job of breaking up the distance outside the park, with some energetic locals and a scenic lake along the way. 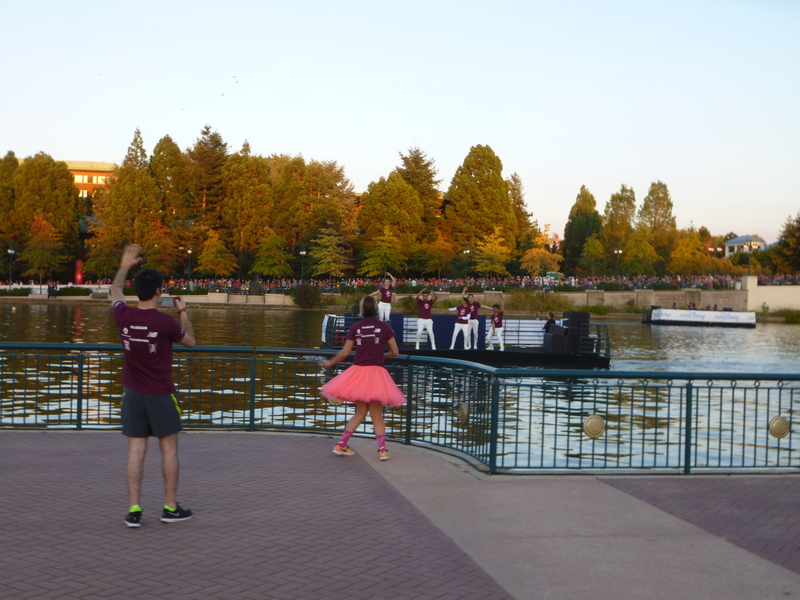 The out-and-back portion of the course was a great time to check out other runners and watch for fun costumes, as well as keeping an eye out for spectators and on-course entertainment. 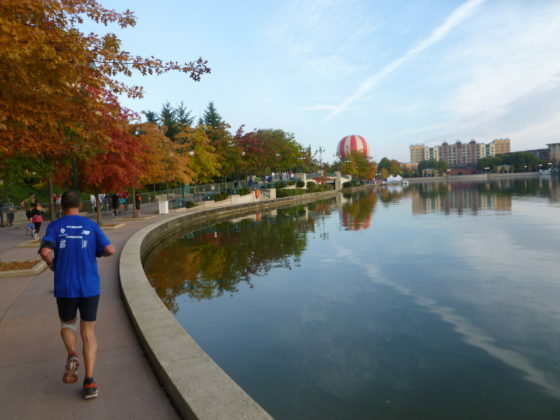 Although spectators remained somewhat sparse, I really enjoyed getting to run through the hotel grounds, since they’re very scenic and it’s always nice to have something to mentally break up the miles. As a result of having started at the very front of Corral B, I spent the entire race getting passed by faster runners. 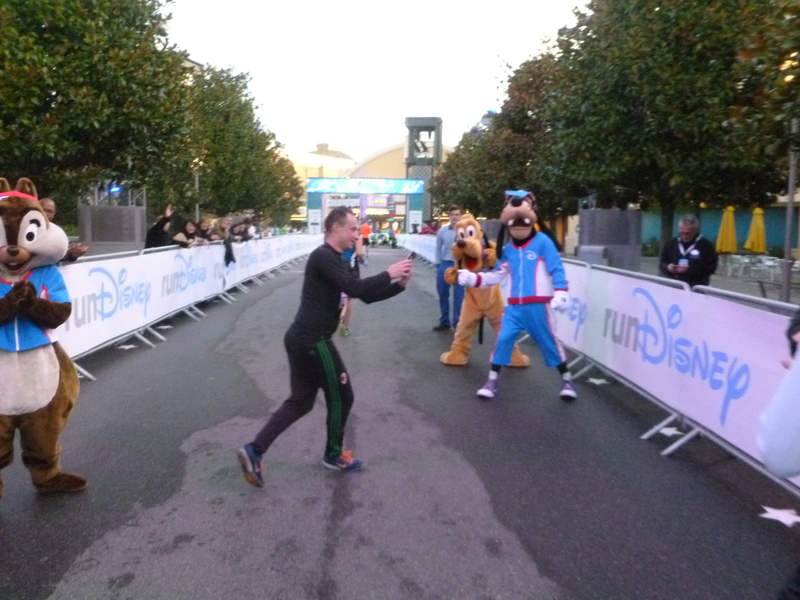 Although I’m no slouch, I’m also not in danger of winning any awards (I typically finish in the top 10-15% of U.S. runDisney races, though I’m much slower by European standards, where runners tend to be more serious); it was fascinating to see the faster field coming from behind throughout the entire race. 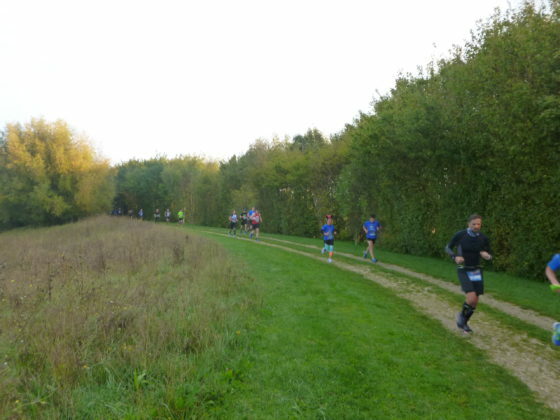 The small wave starts helped minimize on-course crowding, but I can’t help but think those faster runners would have enjoyed their race even more if they had been appropriately seeded from the start. 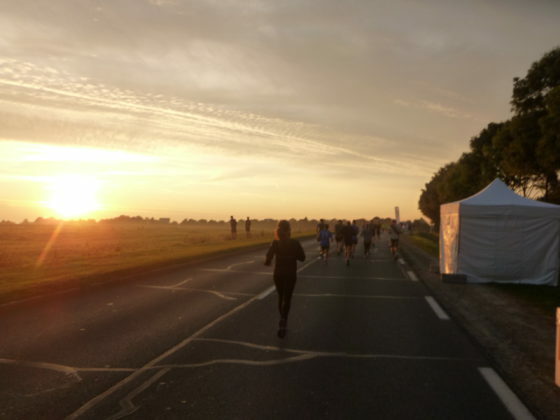 It was fun, if a somewhat unusual feeling, to never really run with the same group for any significant distance, forcing me to really focus on my own race, rather than keeping pace with the runners around me. 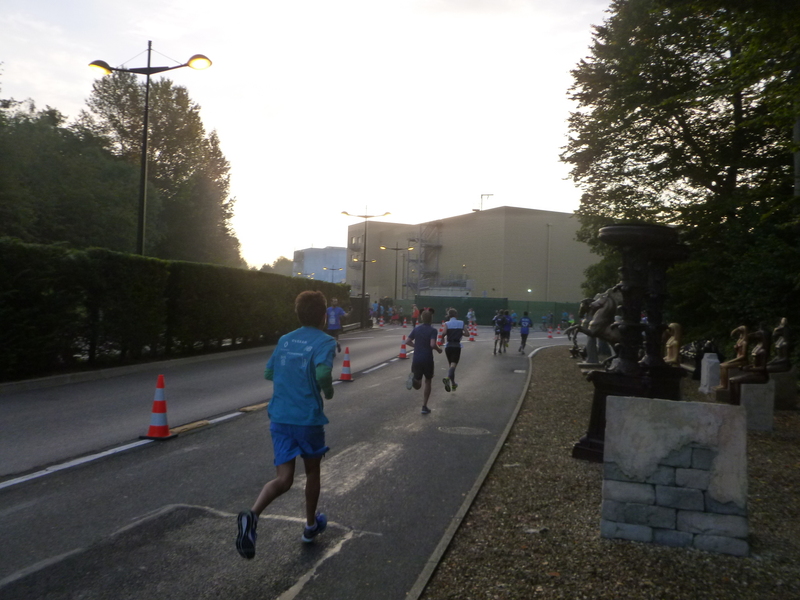 6,579 runners completed the race, with Mondhir Fekir winning in 1:10:30; race ambassador Paula Radcliffe won the women’s division in 1:22:12. Nikita Den Boer won the women’s handisport division in 1:07:08, and Michael Jeremiasz won the men’s handisport division in 2:21:19. I finished in 1:57:06. 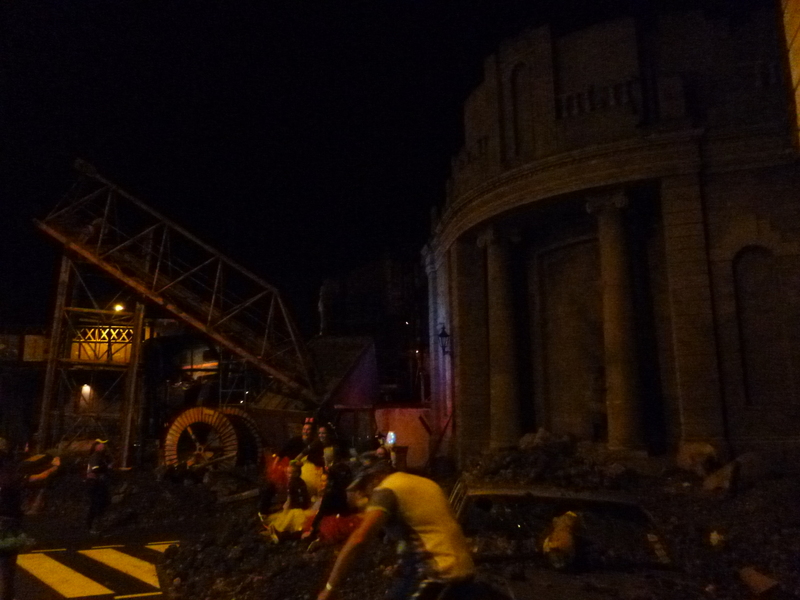 Overall, the weekend was a lot of fun, but it still came off feeling a bit unpolished. 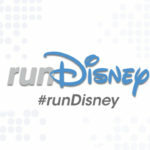 The time between crossing the start line and the finish line is at least as good as any of the U.S. runDisney events (I would go as far to say Disney’s best races, with incredibly scenic courses, enthusiastic Cast Members, and perfect running weather), but everything else is very hit-or-miss. 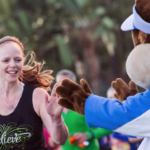 If you’re aiming for a personal record and a controlled experience, this probably isn’t the event for you; if you’re looking for a good time and only taking the run semi-seriously, this is your race. As an American, it certainly feels extravagant visit Europe for only a couple days, but the comparatively cheaper race registrations, park tickets, and off-site hotels can more than offset the slightly higher airfare when compared to a domestic runDisney race weekend, and should be a serious consideration for anybody looking for a fun race getaway. 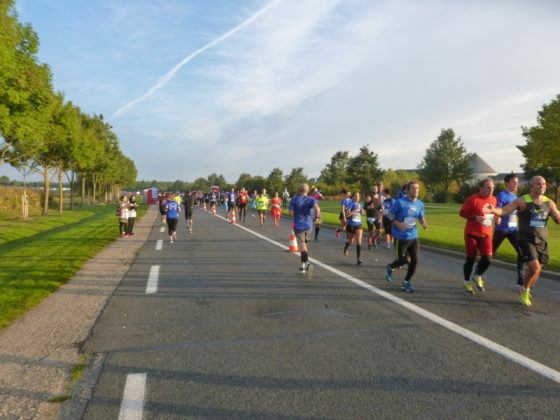 When the weekend was first announced, I was concerned how successful it might be on the same weekend as the Berlin Marathon, which is consistently the fastest of the World Marathon Majors and where world records are often set, and the Paris-Versailles La Grande Classique, a long-running 16km race that’s one of the most famous in France. 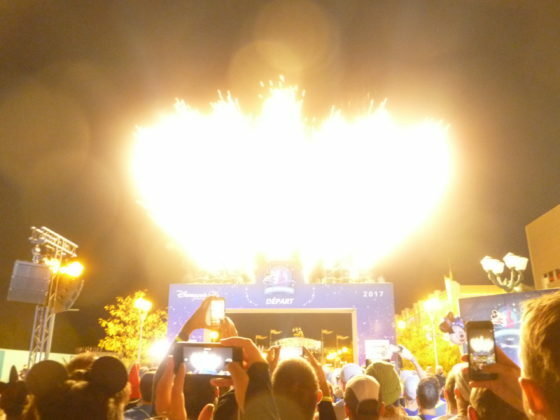 However, the Disneyland Paris event has expertly positioned itself as a fun event, rather than one that’s taken very seriously. More than any other race I’ve done, the announcers encouraged runners to stop for photos, and generally slow down and enjoy the experience. 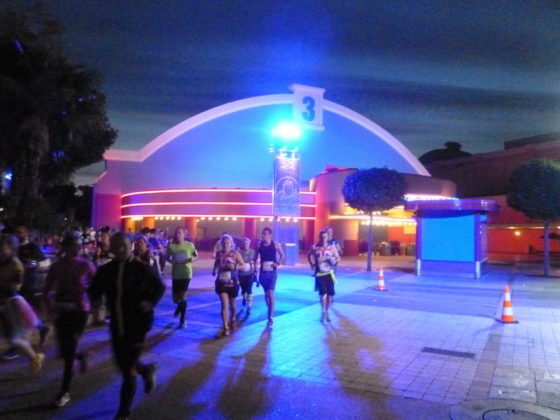 Similar to the “ultimate runner’s night out” atmosphere that the evening runnings of the Wine & Dine Half Marathon had, the crowd seemed to be a lot of relatively well-seasoned runners letting off some steam; first-time nerves weren’t nearly as prevalent as U.S. runDisney races. 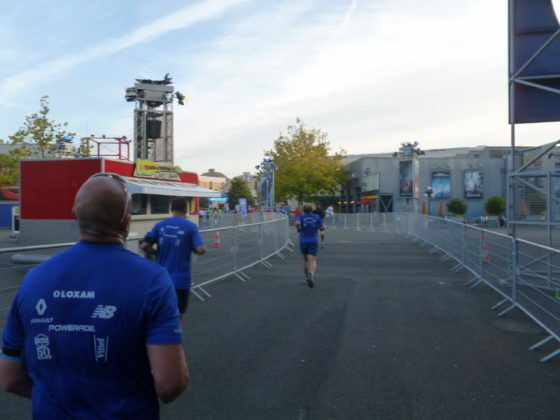 Although there’s still a lot of refinement needed, the second running of the Disneyland Paris Magic Run Weekend was a success, and the event team is already looking to 2018. Kevin has been visiting Disney parks his entire life, including multiple trips to all 11 worldwide theme parks and several years as a Disneyland local. 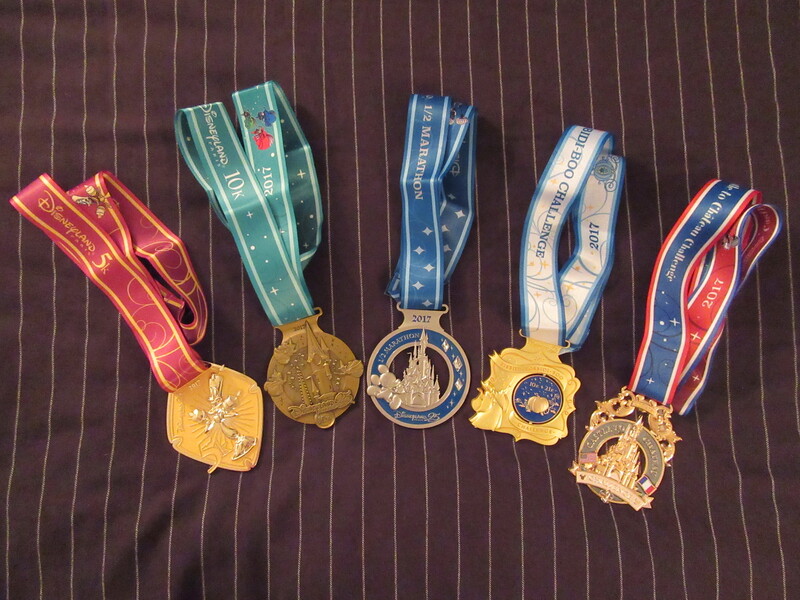 He has been a distance runner since 2011, with over 300 Disney race miles under his belt. 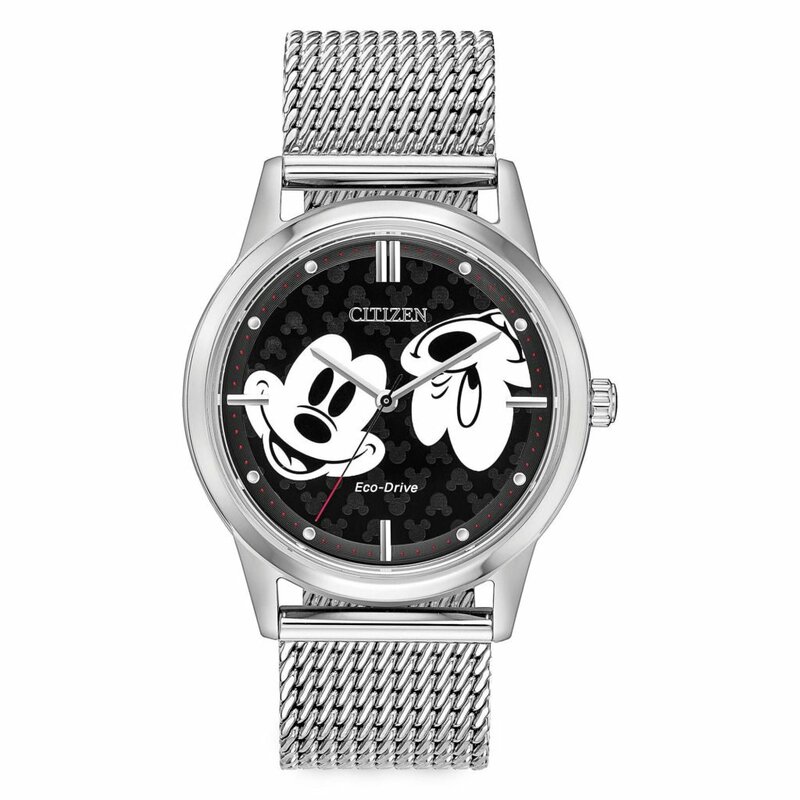 He currently lives in the Washington, DC area and continues to make regular visits to both Disneyland and Walt Disney World.